The first time I went to Boston, I remember it being hard to park. I was there guitar shopping, got myself all the way downtown, freaked out and hightailed it north up to Portland, Maine. I remember being caught in the Big Dig, in traffic for a couple solid hours. Bummer. Fall of 1997. The next time I visited was in 2010. Got my rental car, went right to Cambridge and went record shopping. Hit like five record stores within a five block radius in and around Harvard Square. That was awesome. So I just got back from a wicked Boston romp. Spoke at the HOW Conference, spoke at the Somerville Public library, went ghost hunting for Kennedy lore in Hyannis, took Leigh all the way out to the very tip of Cape Cod, tried like hell to crack a lobster claw (no dice/gross/sea insect), saw a ballgame at Fenway Park, stayed north of the city in Tewksbury, hung eith James Fox from 10Engines, pondered Plymouth Rock, lurked around the Mayflower II boat, thought about pilgrims and the decimation of the native american population, and, wondered nightly about ol’ Paul Revere. A pretty full trip. 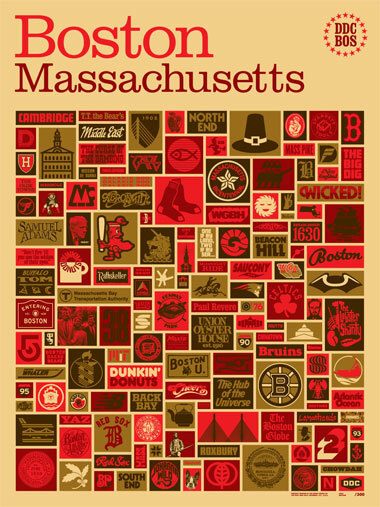 I had a hell of a time, and made a poster about the town, with everything I’ve ever loved about Boston. This time, we drove all over the place with smooth sailing, and found parking places. Thanks, Boston. 01. Printed on thick, uncoated cream poster stock. Looks great! 02. Four colors, inspired by Boston Baked Beans candy packaging. Yep. 03. 18” x 24”! Easy to frame, and still pretty big. 05. Too small up above? Alright you chowdaheads, click this: Get in good and close here. 06. Good for apartments and homes in Cambridge, Beacon Hill, the North End, Fenway and the South End. Spruce up that flat, bud. 07. We tried to eat a Lobster on Cape Cod. Didn’t work for us. 09. Insanely limited edition. Act now! 11. Two free white plastic end puck thingies. Just how we do it.